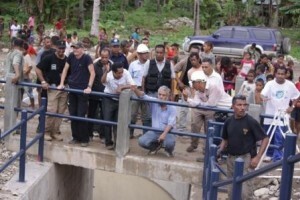 Last Friday the Prime Minister visited Watulari to see the construction of the Bebui irrigation system, that channels water to the rice fields in the Uaitame and Afalokai sucos, Watulari sub-disctrict, Viqueque district. The population of the Matahoi Waitame e Afailokai sucos presented their protest about the fact that they haven’t grown rice for two years now, due to the fact that the rehabilitation of the irrigation system is still not concluded. Presented with this situation, the Prime Minister went to see the referred project in loco, travelling from the Uaitame suco to the Afalokai suco. On the same day, the people’s representatives in the National Parliament (Commission D and G) performed an audit to the project and concluded that the project had no quality. Since the date for the conclusion of the project was already finished, the Prime Minister and the Secretary of State of Agriculture and Arboriculture gave, businessman in charge of the construction site, additional tolerance period of one more month for the conclusion of the project, from 1st of May to the 9th of June. The end which, they will return to the site to reopen the irrigation system so that the farmers can go back to work in their rice fields. During this visit, Kay Rala Xanana Gusmão, was accompanied by the Secretary of State of Agriculture and Arboriculture, Marcos da Cruz, by the Secretary of State of Security, Francisco Guterres and by the community of the Uaitame and Afalokai sucos.